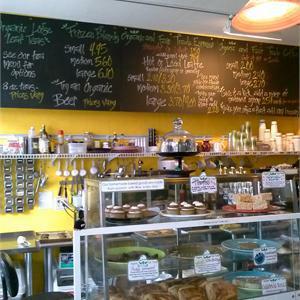 Karma Cream is a locally owned restaurant, coffee, tea and ice cream shop. Karma cream focuses its efforts in ice cream above all however it offers food selections and a drink selection. Karma creams ingredients are all organic, non-GMO and mostly locally sourced. Karma Cream specializes in vegan selections but they do serve regular ice cream in addition to vegan ice cream. All packaging is either glass or biodegradable. The waste products generated are all compostable and are sent to the Gainesville Compost. The primary food selections offered are vegan sandwhiches. The bakery uses fair-trade ingredients, are organic, and made from scratch.